We’ve all heard about the idea of toxic relationships or friendships. The dominant solution is that you cut that person out. You let them go. You’ve tried to love them for a long time, but really the relationship is just not good for either of you. You’ve given a lot and received not much. We’ve all invested time into work. Put in effort to complete an assigned task. Worked really hard at something we’re proud of - only to not receive any appreciation or recognition. You feel a bit deflated. But we’ve also had a really encouraging chat with a close friend. Or listened to an insightful podcast that gives you fresh perspective and motivation. Or got a great mark on an essay. And don’t those things make you feel good? Don’t they give you the courage, motivation, and positive mindset to carry on and continue with those things that you pour so much into yet get so little back from. I think we find that in reality, we actually fall into a cycle of receiving good news or an inspirational message, we feel filled up, we invest into our relationships and our work, and then end up unsatisfied and without motivation. It’s not exactly the most sustainable cycle, would you agree? So instead let us consider how we might live out our interactions with other people in a more sustainable way; let’s consider the cup. The cup metaphor was something my boyfriend, Tim, explained to me awhile back. Each of us has/is a cup which is affected physically, socially, spiritually, mentally, emotionally. Any interaction we have with another person can fill up or take out of our cup, and different people can drain the cup in different ways. What is important is that we don’t pour out of our cup until it’s empty, and we need to make sure we’re getting it filled up too. An empty cup is of no use to yourself and your wellbeing, nor can you be useful to people who need to be filled up from your cup. Now where does God come into this? Well, where you pour your cup may not be where you get filled up and I think this is often where we enter trouble when we’re not aware of this. We pour our love and wisdom into other people, not realising that they may not be currently equipped or prepared to fill us back up. We end up disappointed and frustrated that this relationship doesn’t appear reciprocal. Sometimes I think we might have to accept that there will be some relationships that we just give more to. However, it doesn’t necessarily have to be like that if we let God in. Jesus tells us in Matthew that He will give us rest (Matthew chapter 11, verse 28). Jesus tells us that He can give us living water and we will never thirst (John chapter 4, verse 14). In Psalm 23, David writes that the Lord leads him beside quiet waters and refreshes his soul, and anoints him, his cup overflowing. Jesus can, and should, be our main cup filler. With Jesus, we will never thirst. Sure, a good sermon or podcast, a good book or conversation can be life giving and can fill up our cup but we can’t rely on this to sustain us. We need Jesus. When we love and serve out of our Jesus-filled cup we should never tire or burn out; our cup will never be empty. Loving and serving out of Christ’s finished work and His perfect love and strength, who fills us up to overflowing. I am, however, under no illusion that this won’t be hard work. If we accepted God’s love and sacrifice once and that was all we needed, then we wouldn’t have a relationship. But we are imperfect humans. We need to approach God to fill up our cups often. Each day we should humble ourselves, acknowledging we cannot do it on our own. Each day we should come before God and let Him lead us beside quiet waters so that He may refresh our souls and fill our cups to overflowing. With God, our cups will never be empty. 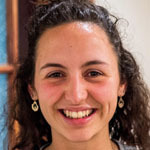 Rebecca Hoverd studies law and geography at The University of Auckland and loves writing as a way to communicate with God and to express her thoughts. She loves coffee, conversations, and would love to hear your feedback at rebeccahoverd@gmail.com.